Clearly, the first step is to agree on what chores need to be done on a regular basis. Sit down with your roommates and put every task you can think of on the table so you don't have to address issues later on. Will everyone be responsible for cleaning up after themselves on tasks such as washing dishes or doing laundry? If so, those chores don't need to be included on the community list, but make sure expectations are spelled out. Once the list is set, decide on the frequency, be it daily, weekly, bi-weekly or monthly. It's easier for everyone to follow if you set up a master schedule, whether you use a wall chart or an app like Chorma or Chore Buster. Chances are that no one will appreciate someone cleaning the bathroom at 1 a.m. Come to a consensus on deadlines, including time of day as well actual day for weekly, bi-weekly and monthly chores. This might seem like the most difficult step, but there are some methods you can use to keep it fair, and maybe have a bit of fun! Open up the floor to volunteers. Some people don't mind (or even enjoy) tasks such as vacuuming or washing dishes. Have everyone draw numbers that correspond to a particular chore on the list. At the end of the month, everyone rotates to the next task in line. Let fate handle the choices by spinning a wheel or drawing from a hat. Bill paying doesn't technically fall under the category of cleaning, but it's a group responsibility that should be settled up front to avoid future problems. Fortunately, there are a number of apps designed expressly for splitting rent and other expenses among roommates to minimize hassles and disagreements. Few roommates fall under the extremes of Felix and Oscar in The Odd Couple, but everyone does have their own standards of cleanliness. Wherever you fall on the spectrum, be open to making compromises in the interest of peace. No matter what methods you use, the original chore schedule doesn't have to be set in stone. Maybe a task needs to be done more or less often, or a roommate can't honor assigned chores due to unforeseen circumstances. Communicate frequently and modify the schedule as necessary. 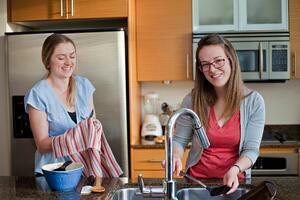 How do you divide cleaning chores in your apartment? Tell us in the comments!